If your portable power backup needs exceed the limited few recharges provided by the normal powerbanks, then 26,800 mAH is the maximum point at which portable and reasonably priced powerbanks are available. 26,800 mAH (or 100 watt-hours) is also the maximum powerbank capacity allowed by TSA for cabin or carry-on luggage in flights. The latest 26800 Mah massive capacity powerbanks will offer you the ability to recharge most of your smartphones up to 7-10 times (iPhone X and iPhone 8+ about six times, iPhone 8/7/6S about eight times, Galaxy S9 or Galaxy S8/S7 five+ times, iPad Air 2 two times). 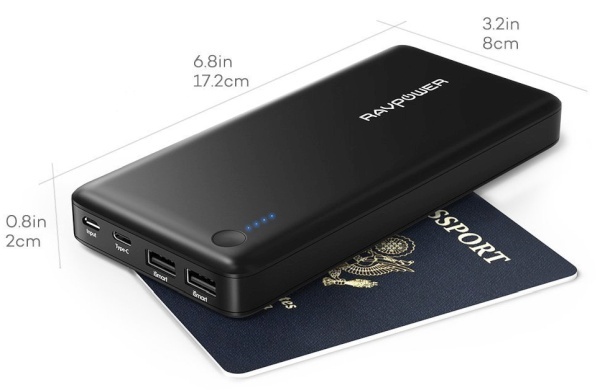 The latest 26800 mAH+ power banks weigh as much as previous generation 20000 mAH powerbanks and enable smartphone use for nearly a week without coming near a wall outlet – an incredibly handy feature for professional users, disaster preparedness kits, mobile gaming and entertainment enthusiasts, power users, outdoor lovers and campers as well as survival enthusiasts. The Anker PowerCore+ 26800 PD and RAVPower 26800 PD are our top picks among the currently available highest TSA-allowed capacity powerbanks. Both these powerbanks support the fastest charging speed (50% in 30 minutes) for the latest iPhones (iPhone Xs, Xs Max, Xr, X, iPhone 8, 8 Plus) and also support the fastest charging mode (9 volts @ 2 amp =18 watt) for the latest Samsung smartphones Galaxy S9, Note 9, S8, S8+, Note 8, S7 etc. as well as most other Android smartphones. Anker PowerCore+ 26800 PD is an ideal choice if you want a future proof fast charging powerbank with a bundled USB-C PD wall charger. The Anker PowerCore+ 26800 PD has three charging ports (one USB-C PD and two USB 3-amp ports). The powerbank itself can be charged in just 4.5 hours using the bundled 30 watt USB-C wall charger or any other 30 watt+ USB-C wall charger such as Macbook or iPad or Pixel wall charger. 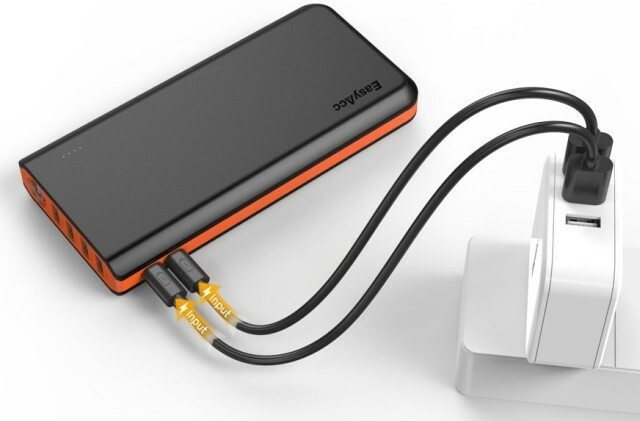 The feature that makes RAVPower 26800 PD and Anker PowerCore+ 26800 PD so future proof is that both these powerbanks support USB-C PD 30 watt output. USB-C PD supports a large range of varying voltages and currents (including QuickCharge 2.0 used by Galaxy S9, S8, S7 etc.). With both Apple and Google Android now supporting 18 watt USB-C PD fast charging in their latest phones, you can be sure that these powerbanks will support upcoming phones for some time. Both the powerbanks can also recharge the latest Macbooks and iPads at speeds equal to that of stock Apple wall charger thanks to the 30 watt maximum output. Additionally, many USB-C ultrabooks such as Pixelbook can also be charged with the RAVPower 26800 PD and Anker PowerCore+ 26800 PD powerbanks. The 9 volt @ 2 amp max (18 watt) mode of USB-C PD ensures that both Anker PowerCore+ 26800 PD and RAVPower 26800 PD support QuickCharge 2.0 used by the latest Samsung smartphones (S8, S8+, Note 8 etc.). The Pixel, Pixel 2, Pixel 2 XL series phones also use 9 volt @ 2amp maximum charging current. The 5 volt @ 3amp max mode of USB-C PD ensures support for Google Nexus 6/5P series phones. The 15 volts @ up to 1.2 amp support charges the latest iPhone X, iPhone 8, iPhone 8+ at speeds (50% in 30 min) that even the stock Apple iphone wall chargers can not provide. 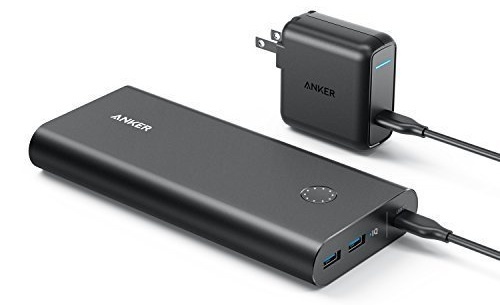 The prices of both these powerbanks are very close when you consider that the higher priced Anker PowerCore+ 26800 PD comes bundled with a USB-C PD wall charger that costs about $30 if purchased separately. RAVPower 26800 PD can be charged in two ways – with any standard USB wall charger (14 hrs) or with a USB-C 30w+ wall charger (5 hrs). RAVPower 26800 PD is an ideal choice if you just want to buy a high capacity powerbank and already have a USB-C wall charger or if you want to use your existing USB wall charger. You can charge the RAVPower 26800 PD powerbank using any standard USB wall charger in about 13-14 hours or by using a USB-C PD 30 watt+ wall charger in 4 to 5 hours. This selectable dual charging feature makes RAVPower 26800 PD the best option if you want a quality high capacity USB-C PD powerbank at minimum cost. RAVPower 26800 USB-C PD comes with a USB-C reversible cable but does not come with a USB-C PD wall charger, which has to be bought separately. Please Note: Only a 30-watt+ USB-C PD wall charger such as Anker 30 watt PD charger or RAVPower Super-C 36 watt Type-C charger or iClever 45 watt USB-C PD wall charger will charge RAVPower 26800 USB-C PD in 4 hours. A regular (non-PD) 30 watt USB-C wall charger will not charge RAVPower 26800 USB-C PD in 4 hours and will take about 10 hrs to charge it. …And of course both , Anker PowerCore+ 26800 PD and RAVPower 26800 PD are allowed to be taken in carry-on luggage on flights, both domestic inside US as well as internationally. The total power capacity is 96.4 Wh – less than the 100 Wh maximum limit set by TSA and other international airline safety authorities. If you have iPhone 7, 7Plus, 6S or older iPhones and require the fastest charging powerbank for your current needs than there are many reasonably priced models available in the market with 2.4 amp maximum charging. These portable chargers will also charge Android smartphones at more than twice the speed of regular wall-chargers & powerbanks (though about 30-40% slower than QC 3.0 or USB-C PD 18 watt). RAVPower 26800 external battery pack is our top recommendation as a massive capacity reasonably priced powerbank for iPhone 7 and 6S. iPhone 7 and 6S support a maximum charging current of 2.1 amp and the RAVPower 26800 portable charger pack offers enough battery power to charge two iPhone 7 or 6s at the maximum charging speed at once with a port to spare. This feature is of great utility to families with multiple iPhones. The RAVPower 26800 powerbank is scratchproof and has a very sturdily build that inspires confidence. This powerbank will also charge all Android phones at quite fast maximum speed of 12 watt. Even though this is not “fastest possible charging”, this is still very good charging speed as the fastest charging speeds for even the latest Android phones are 18 watt in the beginning with charging current gradually dropping to 10 watt and lower levels as the battery gets full. RAVPower 26800 powerbank comes with three charging ports – one fast charging 2.4 Amp port, one fast charging 2.1 A port and a regular 1 Amp port. Total output comes to 5.5 Amp. It also offers 2 Amp rapid input charging which allows you to charge the powerbank in about 14 hours – twice as fast as regular 1 Amp chargers. RAVPower 26800 USB battery bank measures 6.8 inches x 3.2 inches x .9 inches and weighs about 1 pound. Price!!! 🙂 Great for those who do not require 50% in 30 minutes fast-charging feature for iPhone 8, 8+, X. Fast charging 2.4 A ports charge iPhone 7 or 6s at maximum possible speeds. Charges almost all Androids or iPhones from 0 to 50% in 1 hour or less. Scratch proof design and compact powerbank for its capacity (6.5 inches x 3.2 inches x .8 inches) with weight of 16oz. What we do not like! No fast-charging for the power bank. This massive powerbank will take long to charge (14 hours+), with a 2 Amp charger. For powerbanks with this high capacity, fast recharge is useful. USB-C (~ 4.5 hours) or Quickcharge charging. (~5 hours) greatly cut the recharge time. EasyAcc Monster 26000mAh Power Bank has a real capacity of 26800 mAH (higher than given on the package). This monster capacity powerbank has an innovative 2-input feature that allows you to charge the powerbank in just 8 hours using two 2 Amp input ports! This clever feature allows you to charge it in half the time taken by the RAVPower 26800 at #2 in the list. Another distinguishing feature of EasyAcc Monster 26000mAh is its 4 dynamically adjusting USB charging ports. All the four “smart” ports automatically adjust current and can deliver fast charging current up to 2.4 Amp at a single port. Total overall power is limited to 4.8 Amp. Such a large number of ports may allows you to charge phones for your entire family at once! The EasyAcc Monster 26000mAh Power Bank measures 6.57 inches x 3.1 inches x 0.86 inches and weighs 1 pound. We are ranking it almost as equal to RAVpower 26800 even though it has a total power output of 4.8 Amp compared to 5.5 for the RAVPower 26800. EasyAcc’s Monster’s dynamically adjusting ports mean that you can plug your phone in any port for fast charging of up to 2.4 Amp per port. However, only two maximum fast charging 2.4 amp ports can be used at a time as total power is limited to 4.8 amp. The 8 hour fast charging using dual input ports makes it twice as fast to charge than RAVPower 26800. Overall, the two powerbanks compete closely in terms of features and flexibility. 4 dynamically adjusting ports for up to maximum 2.4 A fast charging at one port. Built-in Flashlight – a nice feature for emergency use. A bundled dual USB wall charger would have been very convenient. Anker PowerCore+ 26800 is hands down the winner when it comes to massive capacity powerbanks with support for the latest QC 3.0 input/output thanks to its smooth output and rock-solid build and finish. The Anker PowerCore+ 26800 is a sleek and slim device measuring 7.1 inches by 3.1 inches that is just .9 inches thick. It comes with both QuickCharge 3.0 input and output. The QuickCharge 3.0 output feature charges your QuickCharge compatible smartphones up to 80% in just 30 minutes. The Anker PowerCore+ 26800 comes with a QuickCharge 3.0 wall charger and weighs about 20.8 ounces (590 grams). Here is a list of Quickcharge compatible smartphones/tablets. Even if your phone does not have QuickCharge compatibility, the PowerIQ feature in this battery pack senses the maximum charging current for your device and can charge at up to 3 Amps – nearly 3 times faster than a standard wall 1 Amp charger. The QuickCharge 3.0 input feature allows you to charge your massive capacity power bank in about 6.5 hours flat! Charges iPhones 7, 7 Plus, 6s, SE and below at maximum speed. Update: Anker has recently released a version of its PowerCore+26800 powerbank with USB-C PD charging port. The Anker PowerCore+ 26800 PD features a 30-watt USB-C/USB PD port for charging USB-C devices such as the latest Macbooks, many latest laptops, latest high-end phones such as the IPhone X, iPhone 8+, iPhone 8, & other devices such as Nintendo Switch. The Anker PowerCore+ 26800 PD can also be fully charged using the accompanying 27-watt USB-C wall charger in just 4.5 hours!! Please note that the Anker PowerCore+ 26800 PD also includes support for QuickCharge 2.0 compatible charging used by phones such as Galaxy S8, S7, S6, etc. The Anker PowerCore+ 26800 PD comes with a 30-watt USB-C wall charger and its ability to charge USB-C laptops and Macbooks, besides the latest USB-C phones makes it Anker’s most versatile portable charger ever and among the best portable chargers available. RAVPower 26800 USB-C is hands down the winner when it comes to massive capacity powerbanks that support the 3-Amp USB-C charging required for Google Nexus 6P and Nexus 5X phones. This powerbank also features dual inputs for charging the powerbank quickly and offers a rock-solid build and finish. The RAVPower 26800 USB-C is a sleek looking portable charger measuring 6.8 inches by 3.2 inches that is just .79 inches thick with a weight of 16 oz. It has a total maximum output of 5.4 amps and has 2 USB ports and one USB-C port. 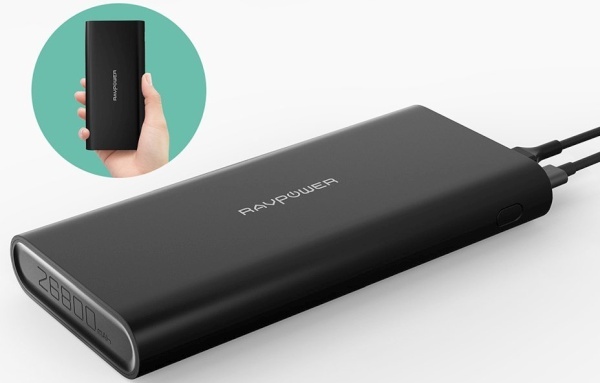 The RAVPower 26800 USB-C portable charger features a unique dual USB-C and USB input feature, meaning you can charge this massive capacity battery in just 7-8 hours using USB-C wall charger AND regular 2 amp USB wall charger simultaneously. No bundled dual USB-C/USB wall charger. Please note that the RAVPower 26800 USB-C is not suitable for charging USB-C laptops as laptops require much higher charging currents than 15 watt. 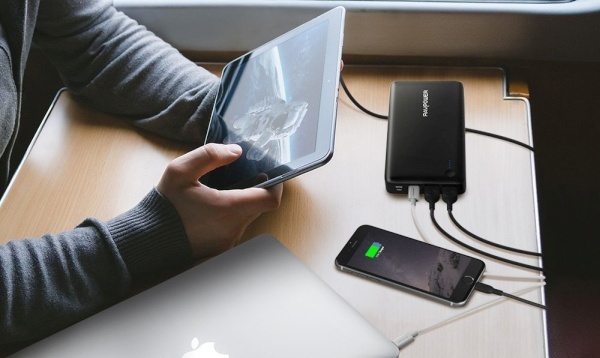 If you intend to charge Macbooks and other USB-C laptops, the best alternative is RAVPower 26800 USB PD which offers 30 watt charging for Macbooks as well as 4.5 hr charging of the Powerbank itself over USB-C.
Hello. I have smartphone Xiaomi Mi 8 Pro (845 Snapdragon), Xiaomi Mi 6 (835 Snapdragon) – both smartphones support Quick Charge 3.0 and two Xiaomi wall chargers (supporting Quick Charge 3.0). Tell me, please, what better choice powerbank for me? PowerCore+ 10050 or RAVPower 10000 QC 3.0 – if you want to charge your phones 2 times from the powerbank. Thank you for answer. Tell me, please, can I buy Anker PowerCore+ 26800 without wall power adapter? Also are Anker PowerCore+ 26800 and Anker PowerCore+ 26800 and PowerPort+ 1 the same? Can I charge powerbank from Xiaomi wall power adapter (from Xiaomi complect)? Is Xiaomi ZMI 10 Power Bank 20000 mAh Type-C Black (QB820) better in quality? Hi Gregory, Yes, you can buy PowerCore+ 26800 without wall power adapter (link to PowerCore+ 26800 without power adapter). Yes, you get the same powerbank in the two listings that you mentioned. You can fast charge PowerCore+ 26800 with the Xiaomi QC 3.0 wall adapter. Xiaomi ZMI 10 Power Bank 20000 mAh Type-C Black (QB820) powerbank is not exactly better in quality when compared to Anker powerbanks with both having similar build quality. ZMI/Xiaomi powerbanks are excellent alternatives to Anker/RAVPower . However, in the US, Anker/RAVPower, in general have better customer service at present. Going on a 2 week trip abroad. hoping to buy a charger to power cell phones for movies if kids are having trouble on the flight. whats the largest charger allowable on flight in the $50 range? we have Moto G 4th generation and Samsung S7. Maximum charging is not priority, only capacity and durabilty. Hi Lalo, We recommend the EasyAcc 26000. Available within your price range, it offers massive 26000 mah capacity, which is well within the maximum allowed on flights and has plenty of ports to charge phones of entire family. It is easily the best high capacity durable powerbank available in your price range. Hi Mickey, Besides Google Pixel 2 XL, Anker Powercore+ 26800 PD will also fast charge iPhone XS,X, XR etc. (thanks to 18 watt PD support), o (lder iPhones such as iPhone 7, 6s, 5s etc. (as it supports 2.1 amp charging) and also fast-charge almost all Android phones (all Androids of last few years either support PD fast charging or 2.1 amp fast charging). This makes PowerCore+ 26800 a safe choice for your charing requirements. Thanks! Great article. I would love if you guys could help me with my question. I need a 26800 mAh powerbank to be used solely for extended backpacking/mountain treks. It will be used to recharge phones, headlamps, tablets, laptops (if possible). The charging for the powerbank will be an Anker Powerport 21w solar charging panel. I have other powerbanks and chargers for home and travel use, this powerbank would be exclusively for use with the 21w solar charger and I would like the battery bank that will charge the quickest using the Anker 21w solar charger. I am not overly concerned how fast the powerbank will charge other devices since that will occur at night while I sleep, so fast charging of devices is not my interest, rather how fast I can charge the bank using the Anker solar charger is the main concern. If solar charging is your only priority and fast charging of the powerbank and fast-charging via the powerbank are not a priority for you, then the best ~26800 mAH powerbank that we will recommend is the EasyAcc 26000 MAH powerbank. This powerbank as excellent compatibility with Anker 21 watt solar panel, excellent 4.8 amp total output, and adequate number of ports (4) to charge multiple devices at once. Dual input charging ports further ensure that it gets charged at the fastest possible speed with the solar charger. In case fast-charging of phones, PD charging, and fast-charging of powerbank via wall charger in ~4 hours are also important, then the best solar-charger compatible 26800 mah powerbank that we recommend is the RAVPower 26800 PD portable charger. Thanks so much! Got the easyacc in this week and it works great! Good thing I came across this site as I’m looking for a high-capacity power bank for my Samsung Galaxy Book 12 which is USB-C powered. Any recommendations? Would really need your expertise on this. Will the USB-C power delivery ports of either the Anker PowerCore+ 26800 PD or the RAVPower 26800 PD be capable enough to power my Galaxy Book 12? The great thing about Samsung Galaxy Book 12 is that it supports both Quickcharge and USB PD charging. This is because the 18 watt “Adaptive Fast Charge” used by Samsung Galaxy Book 12 is compatible with Quickcharge 2.0. This means that both Anker PowerCore+ 26800 PD and the RAVPower 26800 PD will perfectly charge your Galaxy Book 12. 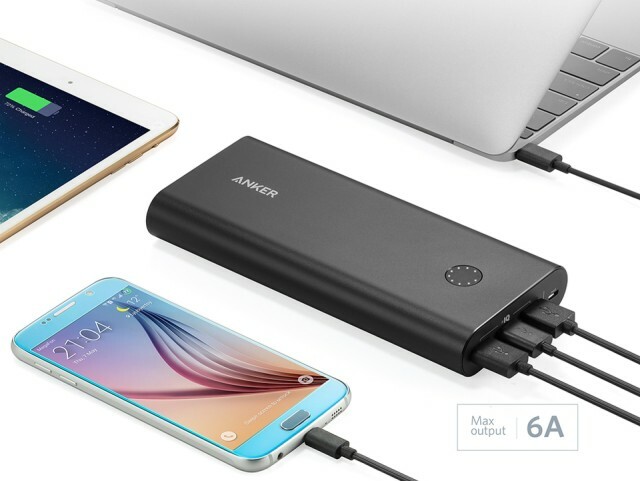 You can even use the much lower cost Anker Powercore+ 26800 with Quickcharge 3.0 to fast charge your Galaxy Book using a USB to USB-C cable. A big benefit of choosing USB PD powerbanks is that if you have an iPhone X or iPhone 8 or iPhone 8 plus, the USB PD powerbanks will also fast charge your iPhone X/8/ 8 Plus. USB PD powerbanks will also fast charge all Samsung phones (S9/S8/Note 9/Note 8) as well. If you go for the RAVPower 26800 PD and require a wall charger, we will highly recommend the Anker Powerport II 49.5W PD wall charger. This 49.5 watt wall charger will allow you to simultaneously charge your Powerbank in 4.5 hrs at maximum speed with its 30 watt USB-PD port and also fast charge the Galaxy Book 12 with its 19.5 watt QC 2.0 compatible port. This means that you have to pack just one wall charger to charge both your Galaxy Book 12 and your powerbank at the same time. All these powerbanks will fully charge the 5070 mAh battery of Samsung Galaxy Book 12 at least three times. Thanks for the great review on powerbanks you created, allowing us to pinpoint the exact model or brand we require. However I do have a question for you. Do we need a PD (30W) wall charger to fast charge the 26800MAH PD powerbanks (regardless of Anker or RAVpower)? Or any USB-C wall charger, such as the 60W 6 port USB-C RAVpower wallcharger will be able to do the job just the same? Yes, Fast-charging 26800mAH PD powerbanks requires a 30 watt+ USB-C PD power bank. This is because fast charging requires high input current and regular USB-C wall chargers can only deliver maximum 15 watt of charging current. For example, the 60 watt 6 port USB-C RAVPower wall charger can only deliver a maximum of 12 watt charging current from any port and this is not adequate to fast-charge the 26800 mah PD powerbanks. It will only slow charge the 26800 mah powerbanks in about 16+ hrs. However, RAVPower 5-port 60-watt USB-C PD wall charger will fast charge any 26800 mah powerbank in about 4 hours as it has a maximum output of 45 watt over USB-C PD port. At night time, the power bank will be used for charging iPhone X, iPhone 8, and also a very low power Bluetooth headset Schuberth SC1 Advanced Bluetooth headset (I have a feeling this headset draws less that 1amp when charging, as I am currently struggling to make my existing power bank stay on, without automatically turning off because it thinks the unit is charged due to low power demand). Possibly a camera too, and might be nice to be able to charge a MacBook or iPad too, but this is not critical. Are any of the devices you review above suitable for this application? I was erring towards the Anker Powercore+ 26,800 PD, as this would give me the fast charge for the iPhone X, and would be able to be used to charge my MacBook Pro, on the rare occasions I ever need, but reading above it is not clear if it is possible to charge this from a normal USB/cigarette lighter socket, or if it only charges from mains power/plugs? Any assistance or suggestions you could offer would be fantastic! I have spent hours trying to find something suitable, but manufacturers are far more interested in boasting about how powerful their units are, than they are about telling you the minimum power input required to charge, and the minimum power draw required to keep the units from turning themselves off every time you try to use them! # Anker Powercore+ 26800 PD is a good choice and it can be charged perfectly well with the Optimate O100 2.4 Amp USB charger using an USB to USB C cable. PowerCore 26800 PD can withdraw a maximum of 3 amp current over regular 5V USB but will charge fine at lower current as well such as with the O100 or any other such charger. Buy the PowerCore 26800 PD for the high-capacity requirements and check if it charges the Schubert SC1. Most likely it should. If it does not charge the headset, then getting an additional Mi PowerBank Pro is a better (and lower cost) option than buying additional SC1 batteries/charger. Mi PowerBank Pro is a lightweight (7.8oz/225 gm), slim and pocketable portable charger (compared to PowerCore 26800 PD) and will make for an excellent backup powerbank. PS. Please accept my apologies for the query/comment not displaying immediately. All comments automatically go for moderation due to unusually high spam comment activity. We go through all comments daily and try posting the response within 24 hrs. Hi guys love the guide. Any chance you could add to the comparison table a mAh/volume or a mAh/weight ratio. I find the biggest disadvantage of checking this kind of product online is the real life physical characteristics and feel of each bank. Thanks Marco! The reason we do not give mAH to volume/weight ratios is that the mAH/weight/volume ratio for the latest powerbanks from top brands are almost same with very minor differences. For example, all top 26800 mAh powerbanks weigh about 1 pound (about 454gm) The similar levels of relative bulkiness of top powerbanks in the market means that mAH/weight ratios are not really helpful for readers while comparing. Hi Fadi, RAVPower 26800 mAh powerbanks are our top pick at the moment as they offer great build quality at very reasonable prices. #If you do not need USB-C PD & if you plan to charge only iPhones only at maximum charging speed, go for RAVPower 26800. If you plan to charge latest USB-C Android smartphones at max charging speed, go for Anker 26800 as it supports 3 amp charging.